As people get older, their teeth get worn out, making a person look older than they actually are. Most of these individuals end up having more issues with their overall occlusion, which result in their problems not being solved by just giving them some new veneers. When their occlusion is really studied over, one realizes they may need their entire dentition restored. This ends up becoming a lot more than what most people have bargained for and when this is discussed, many people are blown away by the cost. So, we are put in a position of doing what is right or not doing anything at all. How many times do dental patients tell you, “Doc, just fix my front teeth. I know you can do it. I don’t care about my other teeth. Nobody can see them anyway.” And if you give in to their request, you unfortunately have created a situation that will most likely keep you up at night wondering when this patient is going to call you with a broken veneer that they say you did and asking why it broke. When I recommend a comprehensive occlusal/esthetic treatment plan to a patient, I use the analogy of going on a “road trip” together. I explain that first I need to understand what their destination is so my dental patients know what to expect. What are their long-term goals with their teeth? Once we have agreed on their goal/destination, I explain it is my job to figure out how to get them there and I will drive. It is their job to share with me on how fast they want to get there based on time and financial constraints. Once I understand this, it is my job to stage the “road trip” for them. If we are going from LA to New York, are we going to get there as fast as possible or do we need to stop 2,3,4,5 or 6 times with a six-month break between each stop? 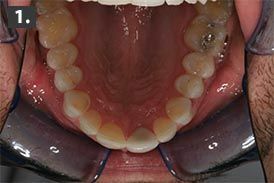 In this article you will learn a technique to stage a full mouth rehabilitation in a way to fit into a variety of budgets. 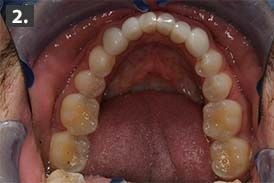 This is possible if you establish a stable occlusal design from the beginning. Then you can restore an individual in any number of phases if needed. 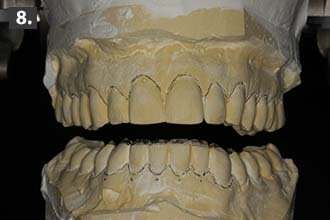 A 43-year-old male reported not liking the chipping that was happening to his front teeth. He also commented he had chewing sensitivity with his lower back molars. He was slightly aware of waking up with tension with his facial muscles. His wish was to have a nice natural looking smile that wasn’t chipping and to be able to chew on his back teeth without pain. Pre-operative maxillary view of the worn occlusal surfaces. Note the extreme wear on the lingual of ##6 and 11. 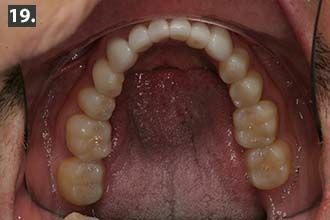 Pre-operative mandibular view of the worn occlusal surfaces and bulky over contoured anterior ceramic crowns. Pre-operative view of the exaggerated curve of spee. Note the occlusal wear and chipped anterior teeth. 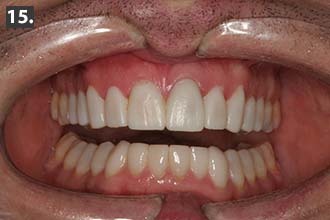 Pre-operative chipped upper teeth that will be repaired. 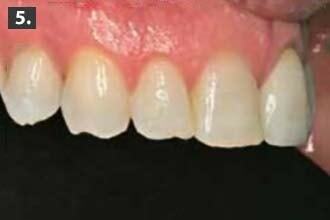 Pre-operative chipped and worn incisal edges. Pre-operative full face view showing the flat smile line. TMJ/Muscle Exam:The masseter muscles were tight on the left and right. The right TMJ was tender to palpation. In Centric Relation the first point of contact was tooth #18 and 31. 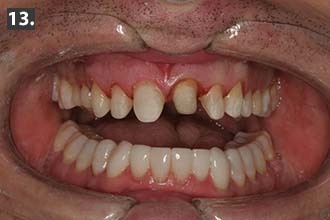 When the patient squeezed his teeth together, he slid forward ½ mm into centric occlusion. 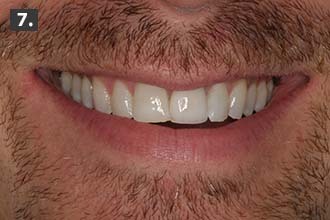 Pre-operative smile view showing the low value #9. Note the disproportionate size between #8 and 9 and the midline cant. Pre-operative models showing the pencil lines on how much shortening needs to be done to help reduce the deep curve of spee. 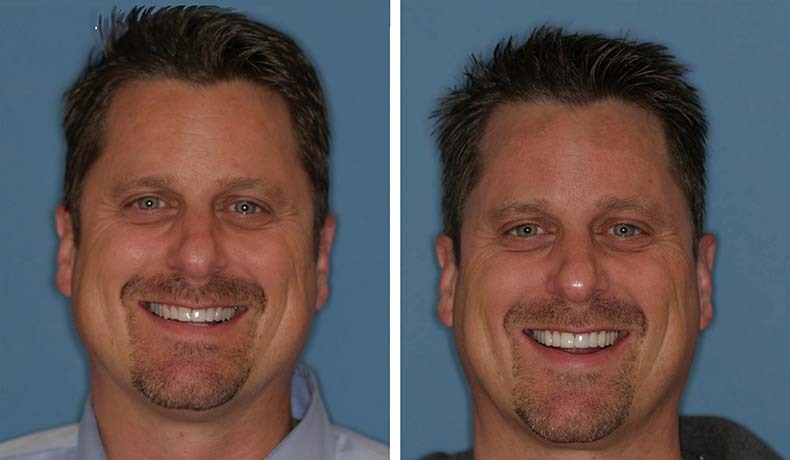 Digital before and after photo template used to confirm the final smile design with the patient prior to proceeding. 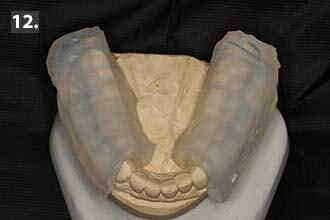 Duplicate model of upper wax-up, lower anterior recontoured crowns and lower posterior wax-up. 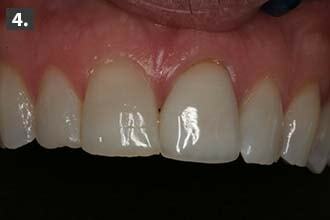 View of lower anterior recontoured crowns and lower posterior wax-up. View of clear polyvinyl matrix seated on the model of the wax-up. At the end of treatment, fabricate a mandibular occlusal orthotic. When this treatment plan was presented, the patient understood the reason for the plan but felt he could not afford to do the treatment all at once and requested a way to phase out this treatment plan over time. He agreed he could afford to do ten teeth. To help the patient achieve what he came in for, I needed to get creative on how we could meet his dental needs. The lower ten anterior teeth is where I wanted to begin but to no surprise, the ten teeth the patient was willing to do were teeth #4-13. This left me the other 18 teeth to restore temporarily. Since one needs, to begin with restoring the lower I recommended to recontour the lower crowns to reduce the exaggerated curve of spee (Fig. 3). Then I could build chairside composite onlays to fill in and level the curve of spee in the posterior quadrants (Fig. 8). Once that would be completed then teeth #4-13 could be prepared. The vertical dimension was opened 1mm in the anterior to reduce the overbite and as a result teeth #7,8,10 had to be converted to ¾ emax crowns vs. veneers to establish occlusal stops on the lingual. 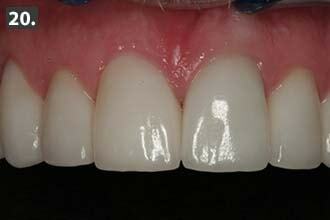 Clinical view of the lower anterior recontoured crowns, finished composite onlays. 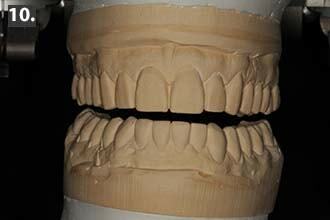 The completed preparations for teeth #4-13 produce a stunning smile. Retracted and smile view of the provisionals two weeks post-op. 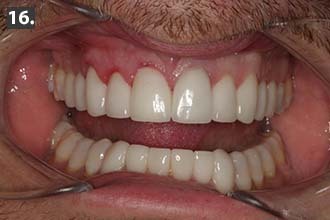 On the preparation day the entire treatment plan above needed to be performed to create a stable occlusion. After the administration of infraorbital blocks to anesthetize teeth #4-13, the siltec putty matrix was used to guide in the recontouring and polishing of the lower anterior porcelain crowns. 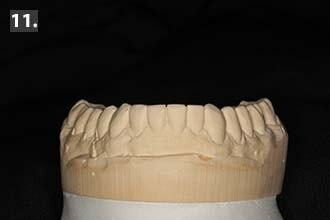 Diamond burs, 3-M soft flex discs, Brassler dialite porcelain polishing wheels were used in this respective order. To create the final polish, Brassler diaglaze with a Robinson wheel in a straight slow speed handpiece was used. Then using an Isolite, teeth #18 to 21 were isolated. The entire occlusal and half way down the buccal and lingual surfaces were pumiced, etched and primed with Optibond solo plus. One needed to be careful to not etch the interproximal surfaces. Once the bonding steps were completed, 3-M A-1 Filtek flowable composite was placed in the occlusal of the clear putty matrix. The matrix was then placed over #18-21, Retracted view one week post-op of final restorations. of his provisionals. 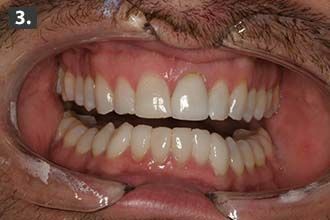 Four weeks later, the patient returned still feeling comfortable with his new occlusion. 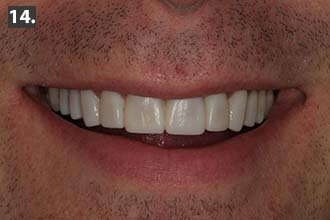 The new restorations for teeth #4-13 were tried in, approved by the patient and subsequently bonded in. A mandibular occlusal orthotic was fabricated and delivered on the following appointment. He returned for follow-up appointments at one week, (Fig. 16) one month, one year and at two years (Figs. 16-21). He “loves” his new smile and plans on finishing the rest of his treatment plan. 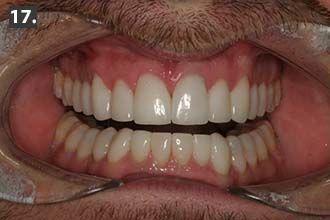 Views of the comprehensive occlusal/esthetic treatment plan two years later. Patient is very pleased. The long term tissue health is stable. Note how well the chairside composite onlays are holding up. At the two-year point, some occlusal wear was noted with the posterior composite onlays. But the author felt these composite onlays were far more stable than trying to maintain long-term acrylic provisionals. There wasn’t one emergency appointment for a lost composite onlay versus the likelihood of acrylic provisionals periodically coming off. Also, the long-term tissue health was stable due to normal flossing contacts between all 28 teeth. When the patient is ready each posterior quadrant can be restored in phases or all at once if the patient so elects. The flexibility is built into the case. And as the practitioner, you can sleep well at night knowing you haven’t compromised the final outcome due to the financial obstacles the patient initially presented you with. Following the above concept, you can get to the final destination and look back on the “road trip” and realize it was a fun, predictable (financially and clinically) and everyone was happy when they got there. 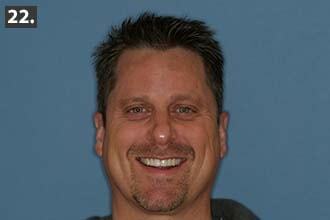 Final full-mouth dental restoration at Montgomery Dental Care in Woodbury MN. 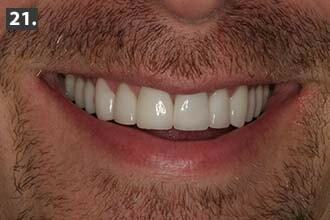 When a patient loves their new smile, the restoration is declared successful. You can get to the final destination and look back on the “road trip” and realize it was fun. 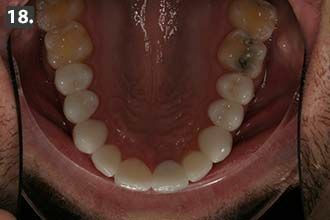 You may download a PDF copy of this Full-Mouth Restoration Medical Article. The author has no financial interest in any of the products that were listed. 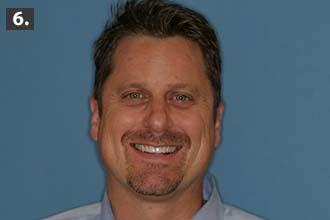 Learn about MACD Trainings by Dr. Marc Montgomery. The author would like to thank Denise Quitter, Tom Quitter, Tim Averbeck and the rest of the team at Valley Dental Arts for their beautiful and precise laboratory work with this case. The digital before and after image was done by Tony Smith at Smile Communications Laboratory. 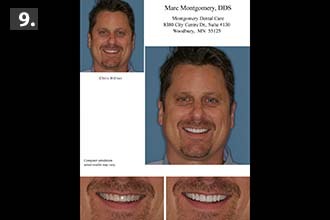 Dr. Montgomery graduated from the University of Minnesota School of Dentistry in 1986. He has maintained a cosmetic oriented family practice in Woodbury, Minnesota since 1986. You will also find this article at Oral Health Group, where it was published on April 1, 2015; it is optimized by Hill Web Marketing. Dr. Montgomery’s technical and artistic expertise coupled with his kind, sincere and gentle demeanor make him an exceptional dentist and a true gentleman I recommend without reservation.